beads of wisdom,put together to form a symphony of words. My work relates to the human experience – be that the human form, figure, energy and experience. The material I use is mainly Kilkenny Limestone, the tones in this stone go from blue grey to a highly polished black. At times this contrast may play an integral part in the composition of a piece. This fresh new art form accentuates the relationship of the sculpting to drawing. 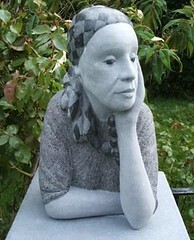 My sculptures bring forth the vivid contrasts in stone in its natural state to create a three – dimensional drawing encapsulated within the sculptural form. The distinction is that this material isn’t formed by adding but by taking away. Nov 2007 Participating in forthcoming Dublin RDS Art Fair (Nov 16th – 18th). Aug 2007	Selected for World Mercy Fund Auction. Looking through Patricks website, you get a sense that there is so much more to these sculptures than meet the eye. To look at them they are beautiful, to understand them they are breath taking. I am still intrigued to think these were once big lumps of stone, and locked inside is this thing of beauty and age old wisdom. It is worth looking through the website to see midnight wave seeking and reclining (if you ever wanted to see what stone would look like if someone was to pour it like wax!). Each sculpture has a story behind it which gives each piece life. Yes ther,what is the crack. I got your name from the Hallward Gallery website.Good Luck with the exhibition.I do think i saw your work in a broucher Barry Felly had one time.Any ways, might see you on the night.